The NBA All-Star weekend is officially over which means the trade deadline is days away. With all the ‘MeloDrama we have dealt with all season long it’s easy to forget players not named Carmelo Anthony can get traded as well. This season the theme heading into the deadline (other than Carmelo obviously) is players on the block being shunned by their current teams (getting the Eddy Curry treatment). And I’m not talking benchwarmers but players that once played significant minutes in the league and may have even been All-Stars or NBA champions. Here is a list of my 5 teams most likely to make a move by the deadline and the possible players to be involved (it should be noted that the teams are not ranked in any specific order but rather just five teams with assets and motives to get a deal done). The Pistons have some veterans with playoff experience that could draw interest from teams as the deadline nears. Detroit Pistons: Joe Dumars has done wonders for this franchise but as it stands now this will mark the second straight year the team does not make the playoffs (currently 4 1/2 games out). He is not one to hesitate on a move (that’s the Nuggets job) and has a roster full of forwards and wings. He could make a move to rebuild, getting picks and young players rather than try to make a playoff push, when the reward for being successful would just be a 1st round exit to Boston or Miami. His main goal will be to unload underused Rip Hamilton (currently in Kuester’s doghouse) and his remaining three years/$38 million contract. The Bulls could be a team interested as they have been looking for starting SG but after committing money and a three-year deal to Kyle Korver this past off-season they certainly will not be willing to pay a high price, as the move will basically take away all cap flexibility for the next three years. The expiring contracts however of both Tracy McGrady and Tayshaun Prince could appeal to several contending teams however and also clear the way for more playing time for Ben Gordon (signed through 2013) and young forward Austin Daye. New Jersey Nets: The latest reports are that NJ is still in Carmelo discussions and who knows how that will play out. But if the Nets miss out on Anthony (or Prokhorov decides to pull out again) I still expect them to make a move. Unhappy with his recent play, they seem motivated to move Devin Harris and now a potential trade with Portland is being proposed (more on them later). It would send disgruntled guard Rudy Fernandez and veteran PG Andre Miller to NJ for Harris and either Travis Outlaw (who started his career with the Blazers and just signed lengthy contract this past summer) or Anthony Morrow. Other names like Joel Przybilla and Johan Petro have been mentioned but talks are still preliminary. But what could be the Nets biggest asset is the expiring contract of exiled forward Troy Murphy. Another player in another doghouse (this time first year Nets coach Avery Johnson) Murphy has been on the block since he was acquired and his $12 million would come off the cap at the season’s end helping any team looking to clear space to rebuild (like teams did for the summer of 2010) not to mention he can play a bit to. A three-point shooting power forwards sounds like someone who would fit the Orlando Magic scheme and GM Otis Smith has already looked into it despite revamping the roster already this year. He decided the asking price was too high but if they could work it out, there’s a possibility Murphy is starting for Orlando come playoff time. Rudy may finally get his wish and an exit out of Portland. Portland Trail Blazers: The problem with the Blazers making moves is that despite the injury woes to Roy and Oden, they are right in the middle of a playoff race in a tight Western conference (or at least seeds five through eight). Not a bad problem to have except the pieces they have are selling pieces, the expiring contracts of Miller and Przybilla as well as the two years left on Marcus Camby’s contract. However, if they were to include Rudy Fernandez, who has wanted out of Portland before the season started, and some of those pieces they could make a move at a player who could help significantly help a postseason run. One such player reportedly on the blocks is Bobcats forward Gerald Wallace. With three years remaining on his contract (two years with a player option), it seems as though Jordan and company are ready to move forward without him and with Fernandez, the expiring contract of Przybilla, and a 1st round draft pick it could be enough to force Charlotte to part with their longest tenure player (remember it was reported the Bobcats were in talks with Cleveland about trading Wallace and that was for just a 1st round pick alone). The Nets deal for Harris seems more likely however at this point, as Harris would be a more athletic point to help them compete against a Tony Parker, Russell Westbrook, or Chris Paul they might find in the playoffs. Cleveland Cavaliers: The team with the worst record in the league (although did just beat the Lakers heading into the break) will certainly be active sellers in hopes of getting anything to excite the city moving forward and try to erase the painful memory of LeBron. Antawn Jamison might be their best player right now but with two years and roughly $28.5 million left on his contract it will be hard to move let alone get anything more than expiring contracts for him. Again the Magic are looking for a power forward but the only contract that will make the numbers match would be the expiring contract of Jason Richardson and I can’t see them parting ways after just acquiring him. With the way Ramon Sessions has been playing lately the last two weeks- 19 ppg, 4 rebs, 9 ast, 2 stl, and with three years left on a decent contract it makes Mo Williams and/or Daniel “Boobie” Gibson expendable. Williams will be the trickier sell as he has a player option after this year and could walk out not only on the Cavs but whichever team he’d be traded to as well. Gibson on the other hand is making slightly more than Sessions but also has three years left on his contract and would certainly appeal to any contending team looking to add a three-point shooter. 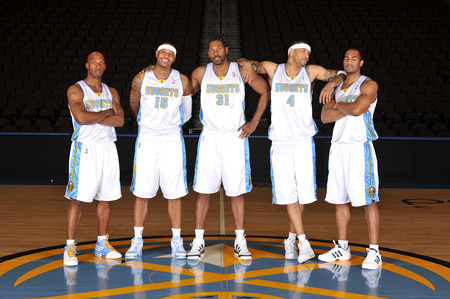 If Denver moves Melo, what will happen with the rest of the Nuggets? Denver Nuggets: It would be hard not to mention the Nuggets as they have headlined trade talk since this past summer. We all know the deal on Anthony, and if he does get traded what does that mean for the rest of their roster? Denver currently has the 5th highest payroll in the league and are well over the luxury tax. If Anthony is moved, I expect a total rebuilding project to occur. JR Smith, Nene, and Kenyon Martin all have expiring contracts and although the Kroenke’s have expressed interest in resigning Smith, I can’t see them committing money longterm to the other two. Meaning they could be acquired on the cheap just so the Nuggets can get something for them (sounds familiar for this team huh?) whether it be picks or young prospects. Billups is also a player the Nuggets would like to get off the cap although he has expressed his desire to want to retire in his hometown as a Nugget. However, this is a business and even if they do decide to keep him I cannot see them accepting the over $14 million team option, as a new deal is far more likely. It should be noted he could be traded, the other team denies his option, and then he returns to Denver next year via free agency. The biggest concern though should be moving Al Harrington and his recently signed five-year contract. If they go into rebuilding mode, they should listen to anybody who would be willing to take on his contract and accept any offer no matter what it is. $33.5 million is committing to much for a team that will be looking to get younger and cheaper unless of course they plan to build around him- not a chance. OJ Mayo would be another dissatisfied player that wouldn’t mind a fresh start, but with the Grizzlies actually in the playoff race and with Rudy Gay now being sidelined for four weeks, I can’t see them moving him now as they will need his scoring and he basically will get a second chance to try to revive his career in Memphis. Mark Cuban has been active around this time and with Caron Butler done for the year he could be looking for a starting small forward. Right now they are using Peja in that role, but this is one place I could see Gerald Wallace ending up. With Butler’s contract expiring at the end of the season, they can just stick with Wallace and it would basically give them a three-year window as serious contenders.